The Samsung Galaxy S3 was originally offered with the Android Ice Cream operating system, and then received both the Jelly Bean and KitKat updates up to Android 4.4.4. The latter included an update to guard against the Stagefright exploit. Android Lollipop, Marshmallow and Nougat were not officially rolled out to the S3 but custom ROMs are available. A word of caution though: using custom ROMs will void any warranty you may have so make sure you've backed everything up before your flash your phone. 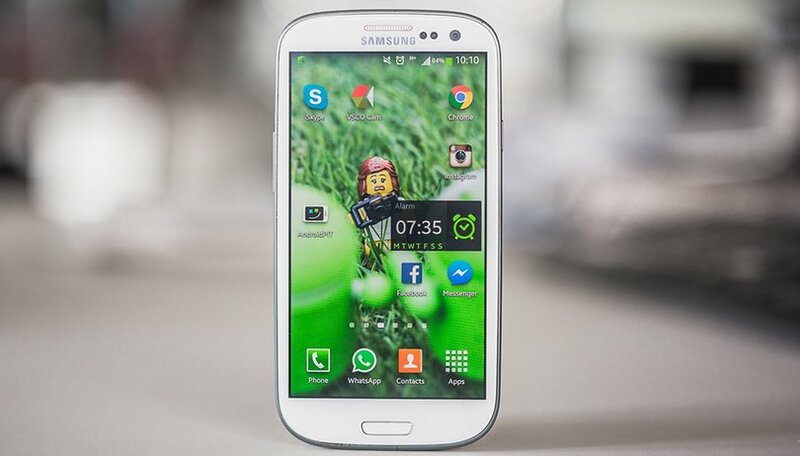 Read on to find how to get the latest Android OS on your Galaxy S3 device. The Galaxy S3 will most likely not be getting the Android 7.0 Nougat update (as it didn't receive Marshmallow or Lollipop either) but fear not, you can still get Nougat on your device using a custom ROM. There are several guides available for how to get Nougat on your Galaxy S3 (7.0, 7.0.1. and 7.1.1) and Lineage OS (formerly CyanogenMod) has also released CyanogenMod 14, which you can install on your Galaxy S3 to get Nougat. It should be noted though that the CyanogenMod 14 ROM is an early build and still contains bugs. The Galaxy S3 did not receive an official update to Android 6.0 Marshmallow. However, the XDA Developers forum has an AOSP custom ROM to get Android Marshmallow on your Samsung Galaxy S3. CyanogenMod also released its CyanogenMod 13 update (based on Android Marshmallow) to the i9300 model of the Samsung Galaxy S3. In summer 2015, it was unfortunately announced that the Samsung Galaxy S3 would not be getting the Android Lollipop update. While the Samsung Galaxy S3 remains stuck on Android KitKat across the board, an update for bearing a security path for the Stagefright exploit should have been received by all Galaxy S3 handsets. However, there is a custom version of Android 5.0 Lollipop available for the Galaxy S3 (GT-I9300) through XDA Developers, which you can download now. Android developers created a CyanogenMod 12.1 build based on Android 5.1.1 Lollipop for rooted Galaxy S3 (GT-I9300) owners. It includes Lollipop additions such as the Material Design aesthetic and lock screen notifications. Have you tried flashing a custom ROM on your Samsung Galaxy S3? What problems did you encounter? Let us know in the comments below. I have GT-I9300 device . I am using jellybean 4.3 how can i get lollipop 5.1 can you please advice me :) ??? I am new to Android platform - have been given an old S3 which I have managed to "soft brick" and fix thanks to lots of reading and you tube videos. I have 4.3 on phone . My problem is i cant get jbed to work - i get it installed but it stops working. I need to get a working version of Java and any working alternatives would be great. All help much appreciated from this android newbie - who is seriously considering replacing the iphone 5 with a android device!!! Hi is there any updates for S3 I9301L? hey guys is it necessary to root my S3 before upgrading jelly bean to kitkat ?? I have upgraded my Galaxy S3 to CM12.1 Android 5.1.1. Everything seems to work correctly but I can't connect to a PC (Windows 10) through a USB lead. The PC recognises that the phone is connected and tries loading the driver, but Device Manager reports it under Universal Serial Bus Controllers as "Unknown USB Device (Set Address Failed)". Any ideas? Download Samsung keys on your computer it should have all the necessary drivers. Try changing to a different USB cable, the stock one works best if it is in good repair. Are you connected to a USB 2.0? Try to connect to a different port with USB 2.0 support. Hi, I have installed android on my S3 i9300 and everything was working fine but bluetooth. Didnt worked. So I have to reinstall the original rom. It connected to my car but the sound was horrible. Anyone with the same problem? I do have the same problem on my Galaxy S3 with the CM 11 Rom installed. To solve this, I need to switch my network from 3G to 2G. Hope this will do the trick for you also. So, you have installed android 4.4 kitkat and to solve the problem with bluetooth not working you switch the network from 3G to 2G? So you will get less speed on internet but bluetooth working properly? i have it installed with galaxy s3 running 5.1 for the last month it works good!